Just ahead of the annual meeting of the International Trademark Association (INTA), where an expected 10,000 trademark lawyers will gather starting Saturday in Barcelona, Wolters Kluwer Legal & Regulatory U.S. and Alt Legal are announcing an integration that will provide one-click access to WK Trademark Navigator from within Alt Legal. Through this integration, which will be formally announced Thursday, Alt Legal subscribers can access relevant WK Trademark Navigator content from within their docketing workflows. WK Trademark Navigator customers who are subscribers to Alt Legal can also access their dockets in Alt Legal through WK Trademark Navigator. If you are not familiar with Alt Legal, it is a cloud-based platform that automates the creation and docketing of intellectual property filings, primarily trademarks. 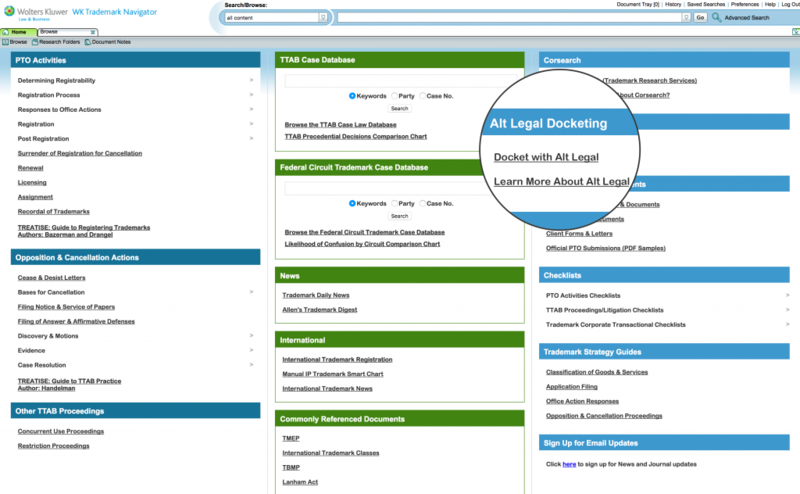 It is used by law firms and corporate legal departments to manage IP dockets and filings. WK Trademark Navigator is a trademark-prosecution reference tool that provides expert analysis, forms, Smart Charts, news, foreign jurisdictional requirements, TTAB cases, and other legal material in a one-stop dashboard. “What we’re doing is taking the best of Trademark Navigator and merging it with Alt Legal,” Alt Legal CEO Nehal Madhani told me last week. With a click, go from Trademark Navigator to your Alt Legal docket. When an Alt Legal subscriber signs in, the platform automatically updates the docket status of all the user’s trademarks and automatically calculates all applicable statutory deadlines. With this new integration, Alt Legal’s docket items now provide links to relevant content in Trademark Navigator to help the attorney understand and execute the next steps in the matter. 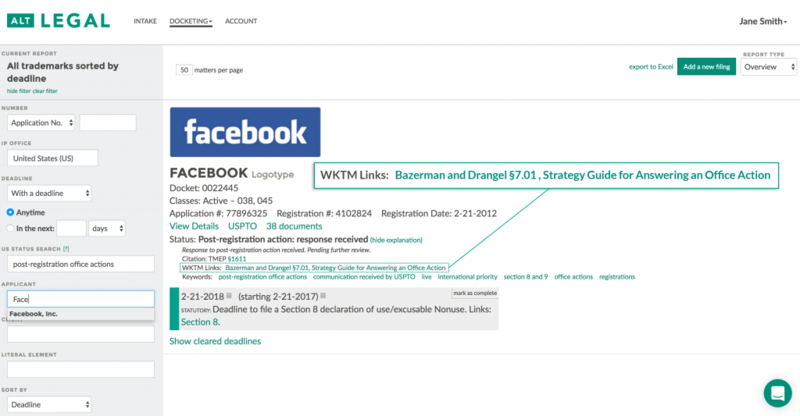 For example, in the screencap at the top of this post, showing an item from Facebook’s trademark docket, the item shows the status and then includes a link to the relevant section of a guide to registering trademarks available on Trademark Navigator. 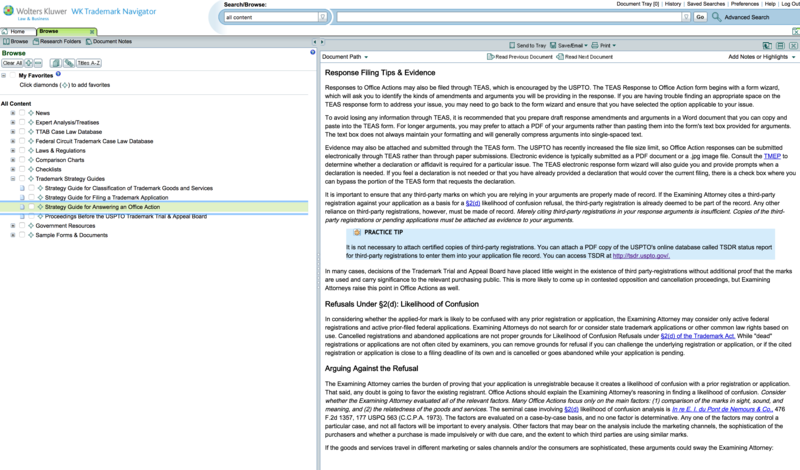 Click the link to jump to that article in Trademark Navigator, as the second screenshot above shows. The link associated with an item is always tied to the status of the item, as automatically updated by Alt Legal. In addition, the integration enables users to go from Trademark Navigator into Alt Legal with one click and vice versa. To enable the integration, users will need subscriptions both to Alt Legal and Trademark Navigator. They would then access their Alt Legal account and enable the Trademark Navigator integration. Only those who enable the integration will see the links in Alt Legal docket items to Trademark Navigator. Information about the integration: https://www.altlegal.com/wknavigator. Read more about Trademark Navigator: https://lrus.wolterskluwer.com/wktmnavigator. View a video about Trademark Navigator: https://www.youtube.com/watch?v=OyfcXhMwCSw.